Need a little bit of help with design ideas…. read on. Will you be mailing the by itself or as part of a bigger pack? Is it for an exhibition? How will you distribute it? SENDING US YOUR FILE TO PRINT? …..
WE WANT YOUR FILES TO PRINT PERFECTLY. WE WANT TO CHARGE YOU THE LOWEST PRICES. WE WANT TO GET THIS RIGHT FIRST TIME. PDF File Type. Please provide your files in high quality pdf format. Artwork NOT produced with Microsoft product – these are incompatible with Adobe InDesign which we must use to print. e.g. standard Business Cards should be set up 96mm x 61mm. 3mm Bleed Make sure that your background colours and photos extend out fully to the edge of the bleed. This allows tolerance during guillotining. 4mm Quiet Zone Keep important text or other elements 4mm away from the edge (the quiet zone). This again allows tolerance during guillotining. Large Areas Black Areas that’s larger than 20x20mm needs to be made out of 20% cyan and 100% black. No Spot Colours or Pantone Colours We only accept CMYK process colours. No Four Colour Black Text This removes the potential for mis-registration and blurred text. Minimum 8pt Type Size (not applicable to Black) This removes the potential for blurred text at small point sizes. Text to Outlines We may not have your fonts so please convert all type to outlines. 300dpi Image Resolutions This ensures a quality print rendering of your images. No Crop or Printers Marks Please do not add these. Our process will add everything that is required before it goes to print. Files that do not meet these requirements will be returned and there is a $15 charge each time this happens. Help You Pick the Right Product There are a variety of products and finishes available and we will help you pick the right product for your purpose. Log Your Job We enter your job into our system and the Printstop system. We give you a quote and ask for approval to proceed. Check The File Once the file is prepared or sent to us, we check everything the designer checks and more besides. Layout Your Print File We take your file and put it into the specific InDesign template for the product that you have ordered. Produce The Actual Print File We create a PDF/x-1a file from the InDesign file so that it has the specific settings for the printing press. Send You A Proof You will receive an email from us with a proof on a proof signoff sheet, along with a tax invoice and an order confirmation. The order confirmation will detail everything about your job. Recheck The File Yes, we recheck everything again! Because we incur a penalty from Printstop for submitting a file that is not compliant. Submit Your Job If you approve the proof and we have received payment we then send the file to the Imagesetter via an ftp server. calendar with the date that Prinstop guarantees delivery of your job. picked up. Delivery to you can be arranged at an additional cost. Direct mail is a really effective marketing tool — and we’ve got lots of clever things for you to mail. Don’t give your postie more work — use addresses that aren’t likely to be returned undelivered. Better to mail the same person three times, than mail three different people. It takes repetition for your message to sink in. In this electronic age, there’s no excuse for sending standard letters — personalise every one. Give them enough information to get to the next step, but don’t overwhelm them. Features bore, benefits sizzle. Explain how their life will improve — not what the buttons do. Tell them about the buns, not the ovens! Now we’re not suggesting your brand has consumed twice its body weight in mince pies and mulled wine over the festive period. Not at all. We’re talking about a different kind of detox. And one that doesn’t involve a plastic tube and 6 litres of water. Or Gillian McKeith. Your choice of typeface says a lot about you and your business. An important first step in creating your brand is to select an appropriate font family which suits your desired image. Don’t worry, we can help you choose wisely. Was your logo designed in “WordArt” or “MSPaint”? 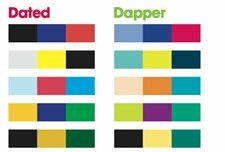 Is your colour scheme in the dated list below? Just like your wardrobe, colour tones can go out of fashion — that’s why some major brands make subtle adjustments to theirs through the years. Do people ever say “oh, I didn’t realise that’s what you did”? Do your business cards have “Printed for free” by someone on the back? If you’ve answered Yes to any, we need to talk. Your brand may need a detox. Give us a call and we can arrange for a free and honest appraisal of your existing identity. It needn’t be painful. Sometimes we can spend an hour or two on a quick facelift. Or if you can afford to invest a bit more in your identity, we’d be delighted to chat through some options.